If you have very heavy, large equipment to store, you’ll want to take a look at Chatsworth Products Heavy-Duty Wall-Mount Equipment Rack 23"W x 73.5"H. This rack is high strength yet lightweight, with aluminum construction. When mounted to wall or backboard, this heavy duty rack can hold up to 350 pounds. All necessary lag bolts and mounting screws are included to provide easy assembly. A great cost-effective yet heavy weight solution for IT facilities is the Chatsworth Products Adjustable ServerRack and Adjustable QuadraRack. This versatile and expandable solution is available in four different height and depth ranges. The mounting channels can be adjusted during assembly, then fixed to secure and protect your equipment. Front and rear frames are welded for strength and to lessen the time of assembly. 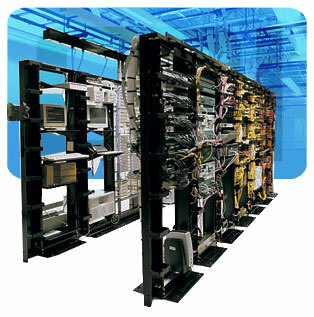 The Chatsworth Products Adjustable ServerRack and Adjustable QuadraRack are ideal for supporting data storage, network and computer server equipment. Do you need support for your patch panels and switches? Your ideal choice in a rack might be the Standard Swing Gate Wall Rack 19. This versatile Chatsworth Rack swings out to the right or left, supporting single-sided and double-sided shelves. It supports up to 100 pounds of equipment, closed or open. Whatever your peripheral storage needs, there’s a Chatsworth Rack that’s easy to assemble and just right for you at www.TWAcomm.com.